The question I ask myself, as a Rod Stewart fan since I first heard "Maggie May" in 1971 aged twelve, is do I need another Rod Stewart album? Yes, on balance I probably do. Just. The last two have been pretty good, since Stewart re-discovered his songwriting muse with the writing of his autobiography, but they have not been ones I have particularly revisited. I suspect this one may be the same, but fair play to him for still putting out vibrant, muscular rock albums, which is what this one mostly is. As you would expect, though, it is crammed full of nostalgia. 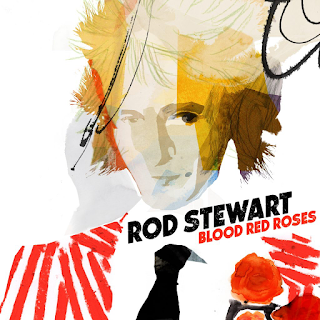 Rod's voice still sounds powerful and can cope with the thumping, contemporary programmed drum and bass sounds. The first track, "Look In Her Eyes" is a good, upbeat one, but I find it slightly overwhelmed by the pounding backing, but that is just the way songs are produced in 2018. Rod has always wanted to keep abreast of current musical trends, so that is the way it is going to be. Some searing guitar riffs introduce the rocking "Hole In My Heart" and Stewart is on great vocal form here. Two songs in, it must be time for a nostalgic look back at a misspent youth in those old London days in the mid-late sixties and Rod delivers with the lovely "Farewell" (using the same title of his earlier 1974 hit). Listening to it, it is a heartbreaking goodbye to an old friend from those days who has recently passed away. Some may say it is cheesy. Not me. It is extremely moving. When he enunciates "milli-OH-nnaire" like he used to in the seventies, (on "You Can Make Me Dance, Sing Or Anything") it takes me right back. "Didn't I" has been around for a few months now and is another emotional song sung by Stewart in the role of father to an errant, drug-taking daughter. I am not sure if its true. He sings with a singer called Bridget Cady who I am not familiar with. It ends a bit abruptly, though. The previous album, "Another Country" saw Stewart delving into Celtic folk songs for his inspiration on several occasions. Here he does so again with some rousing Irish-style fiddle for the strident, tub-thumping title track. The Irish feel continues with the wistful, maudlin "Grace" which is a cover of an Irish "rebel song" (written, however, in the eighties, not 1916-17) He does it pretty well although it will receive criticism for being overblown, no doubt. It is an emotive song and it is clear to see why Stewart was inspired to cover it. Then it is time for some genre-hopping as we get a synthesised disco beat for "Give Me Love" which sounds as if it should be on one of his eighties albums. Like those, it is similarly unremarkable, to be honest. Some killer bass lines on it, though. "Rest Of My Life" is a catchy, convincing Motown-sounding song taking Stewart back to a sound he always loved. He sounds great on the one. You know, all this stuff is nothing ground-breaking, but I still can't help but like the hammy old whatever. His songs just make me feel nostalgic. They are intended to, no doubt, so they are doing their job. "Rollin' And Tumblin'" is a stonking cover of the old Muddy Waters song, taking Stewart back to his original mid sixties blues roots. It is the most credible song on the album. If only he would release an album of blues covers as opposed to easy listening crooners. I wonder if the girl in the romantic, nostalgic "Julia" is the same one who appeared in 1978's "Last Summer" on the "Blondes Have More Fun" album? There is lots of looking to the past on this album, as there always have been, to be honest, even in the seventies, Rod was looking back to the sixties. "Honey Gold" is another retrospective memory, for an old partying pal from his Faces days (unnamed). "Vegas Shuffle" is a bit of a throwaway that is pretty superfluous. It sounds like something from the early nineties. "Cold Old London" ends the album with more shameless, unrepentant looking back. Bridget Cady joins Rod again for a tender ballad, the only real one of its type on here. On first listen, I have to say I have enjoyed this album more than I thought I would. Of the last three - "Time", "Another Country" and this one, I think I like it the most, certainly on first hearing, although obviously opinions can change. Anyway, good old Rod.